While USD is staying strong, the Italian bond markets are putting EUR under pressure. 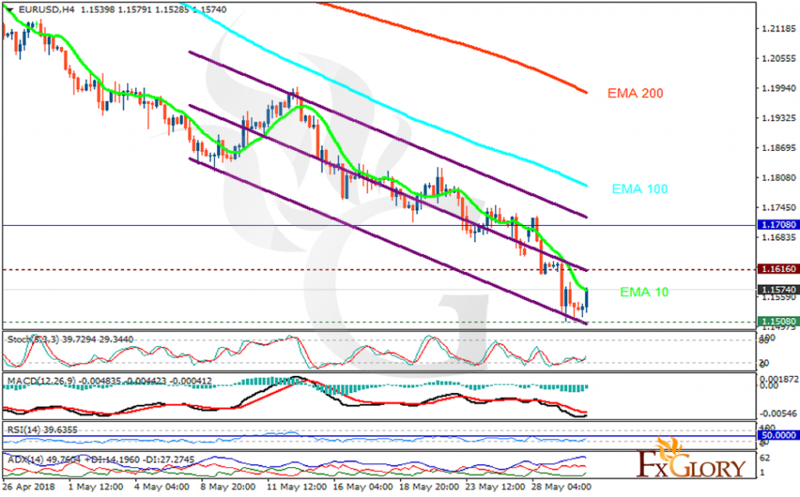 The support rests at 1.15080 with resistance at 1.16160 which both lines are below the weekly pivot point at 1.17080. The EMA of 10 is moving with bearish bias in the descendant channel and it is below the EMA of 200 and the EMA of 100. The RSI is rising towards the 50 level, the Stochastic is showing upward momentum and the MACD line is below the signal line in the negative territory. The ADX is showing weak sell signal. The support area seems to be too strong to be broken therefore, short positions are recommended towards 1.15.